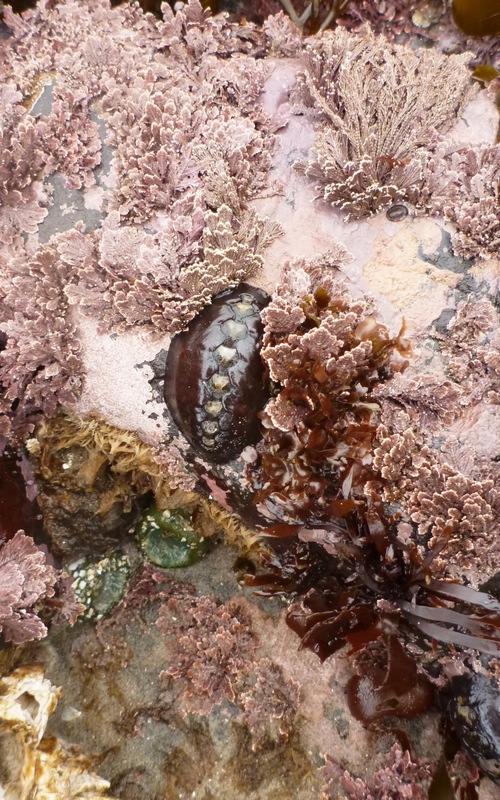 Here is a nice view of a black leather chiton, Katharina tunicata, on an encrusted boulder way out in the infralittoral fringe. Besides the main attraction, there is a lot going on on this patch of rock; predominantly a good showing of encrusting and branching coralline algae, which is typical on rocks in the lowest intertidal and shallow subtidal zones. K. tunicata are sometimes called black Katys. The one shown here is a little over 3 inches long and they can grow to over 5 inches. Blacks are hefty but by no means the biggest TOS chiton. They move around slowly, scraping algae and other organisms off the surface of their rock. This one’s head is pointed down, and its mouth, which is on the underside, is pretty much right under the lowest valve (shell) – the head valve. The head valve is the first in a sequence of eight valves. Beachcombers know the valves as butterfly shells. If you want to learn more about Katharina tunicata check out the Pacific Rocky Intertidal Monitoring: Trends and Synthesis species account and the University of Alaska Southeast species account.